National Geographic set up a Mars experiential exhibit in New York City to celebrate the premiere of the new docudrama mini-series, "Mars." NEW YORK — National Geographic is bringing Mars down to Earth this week. New Yorkers can visit the Mars experiential dome in lower Manhattan to get a taste of what it would be like to go to the Red Planet. Visitors have the opportunity to experience Mars by putting on virtual reality headsets and climbing into a cable robot motion simulator that mimics a spaceship landing on the Red Planet. In another room, guests can hop onto an anti-gravity treadmill to feel what it would be like to walk on Mars, which has just 38 percent of the gravity on Earth — all while wearing a VR headset to get the full experience, of course. In a unique storytelling format, science experts join the science fiction story by providing commentary throughout each episode. These "big thinkers," as the National Geographic crew calls them, include people like NASA Administrator Charles Bolden, SpaceX CEO Elon Musk and several former astronauts, including Mae Jemison, the first female African-American to go to space. Jemison trained the actors in the series on how to walk, talk and behave like astronauts. For this week only, space fans can experience what it's like to be one of those astronauts, on a mission to Mars. 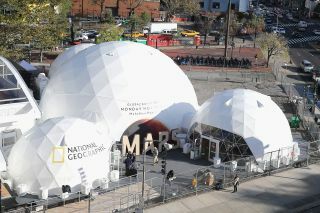 Admission to the Mars Experiential Dome is free, and the exhibit is open until Saturday (Oct. 29) at 7 p.m. EDT. It is located in Duarte Square in the SoHo neighborhood of Manhattan.